It’s no secret I like Virtualization technologies a lot. I have written several other articles on some of my tips and tricks mostly involving creating Virtual Machines of OS X. You can read some of those here, here, here or simply just search my blog. For those who support multiple operating systems or simply have a desire to learn about them, Virtualization is a fantastic way to just that. Virtualization, in computing, is the creation of a virtual (rather than actual) version of something, such as a hardware platform, operating system, a storage device or network resources. Here is a good description tailored to the IT professional or CEO http://youtu.be/MnNX13yBzAU but you can get a good grasp of the concepts. At my organization I have installed and manage a VMware ESXi clustered installation on a SAN (Storage Area Network) with hardware and software that starts in the six figures. This is obviously way out of reach of the home user or enthusiast. But Virtualization can be inexpensive and or downright free for the taking. Microsoft, VMware and Virtual Box all have freeware solutions! 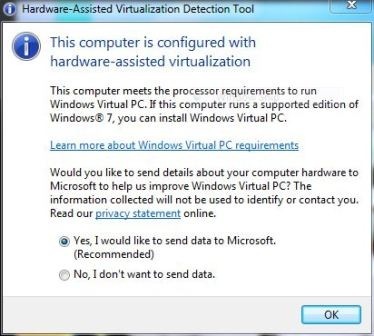 Virtualization product or solution such as VMWare Workstation (and the ‘industrial ESXi), VirtualBox and Windows Virtual PC often require Hardware Assisted Virtualization (HAV) CPU feature in order to function properly as it allows a virtual machine hypervisor to run an unmodified operating system without incurring significant emulation performance penalties. The largest chip makers, Intel and AMD implement hardware assisted virtualization in their processors as Intel VT (VT-x) and AMD-V respectively. However, not all modern CPU has hardware-assisted virtualization capability built-in though; you will want to make sure. The VT capability in the processor on the computer is built onto the tiny piece of chip, and cannot be added or removed using any manual process. And even if the CPU features VT, it must be enabled in BIOS. Most newer CPUs include VT operation by default. However, some older or even current processors available for purchase for DIY or operating on OEM computers may not support VT. When there is no VT support, Virtual Machine Technologies based on VT may fail to install or cannot be powered up and started. If you are going to create or use virtual machines you should verify, check, determine or get to know whether his or her PC computer supports hardware-assisted virtualization. There are a few software utilities you can use to quickly determine whether there is hardware virtualization system on the system CPU. One is name named SecurAble which is able to display hardware virtualization support status as Yes, No, Locked On and Locked Off. The other is Microsoft’s HAV Detection tool. I use SecurAble the most for checking for Hardware-Assisted Virtualization. Microsoft has also released a application tool that able to detect status of Hardware-Assisted Virtualization (HAV) support on the computer system’s CPU microprocessor. Aptly named as Hardware-Assisted Virtualization Detection Tool or simply as HAV Detection Tool, the utility can detect and check if the computer meets the processor requirements to run Windows Virtual PC, i.e. hardware-assisted virtualization. So after you’ve determined you can run virtual machines with HAV you’ll want to try some VM’s out. As I mentioned for home use I’ve found Virtual Box to be the easiest to use and configure. You can get it here and get the ‘Extension Pack’ here. Install the application first (get the right one for you platform – Windows, Mac, Linux) Then install the Extension pack; it will install automatically IF you’ve already installed the base application first. Once installed you are ready to start working with just about any operating system you want to within your current system! 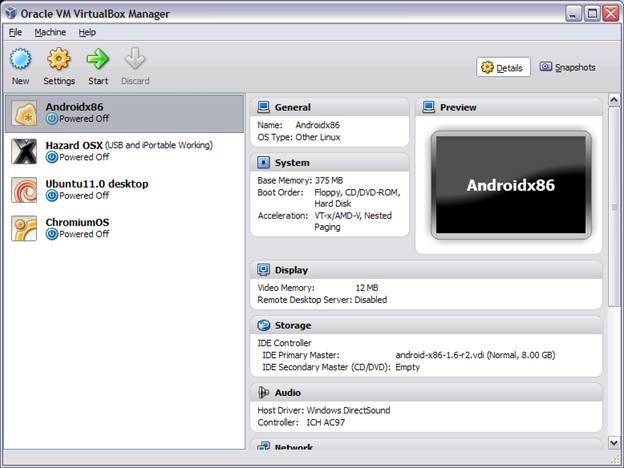 VirtualBox.org has a very detailed description and walkthroughs too, you can find that here. The easiest way to get started with VirtualBox is to import an already made image/appliance. Virtualbox.org has many already made Linux installations you can get them here. And with a little diligent searching you can find LOADS of them. I hope this helps some to get started and have a better understanding of these technologies. More knowledge and experience can only be good. Here is an image of some of the VM’s on one of my home machines in Virtual box. As I noted if you are interested in OS X VMs you can go here and read the second half on using Virtual Box. Here are two walkthroughs from other tech sites worth checking out too. I use Acronis to create images for true disaster recovery ability. With Acronis I can also mount back up images and retrieve any needed files in minutes! The newer versions of Acronis also allow you to convert your Acronis images (.tib) into Microsoft Virtual Hard Drives (VHDs). So back to my VHD issue. Another cool tool is the Microsoft Sysinternals Disk2vhd tool. This can create VHDs from any MS Windows version from XP forward. I’ve been able to mount the VHDs created with this tool and been able to retrieve files with ease. So after creating a few VHDs with the Disk2vhd tool I decided I wanted to use one of those VHDs to create a full blown VM and run it with Virtual PC on my Windows 7 laptop. With Windows 7 and 2008 Server you can very easily ‘mount’ VHDs right from the Disk Management console. They can also be very easily converted to other image formats that can also be ‘mounted’ so you can retrieve your files. However after trying to create the VM and ‘attach existing VHD’ I keept running into a very frustrating problems. What does it mean? Not much info in the error, arrrg. This very well presented article is great. It helped me to solve the problem fairly easily! But I have something to add to this fix that make it so much easier! You can simply ‘attach’ the drive in Windows 7 (Windows 2008 Server too) Computer Management Console>Disk Management, then right click and ‘shrink it’. Once that is done ‘un mount’ and then use VHD Resizer! That’s it. Skipping the use of DiskPart. Very easy and quick. Just thought I’d pass that on for any of you other techies who have run into that or may in the future.